Punxsutawney Phil may have predicted six more weeks of winter but in a week the heat will be turned up in New Cumberland, West Virginia as Made Men Boxing brings championship boxing to the Mountaineer Casino and Resort with a card being billed as Cupid's Knockout. 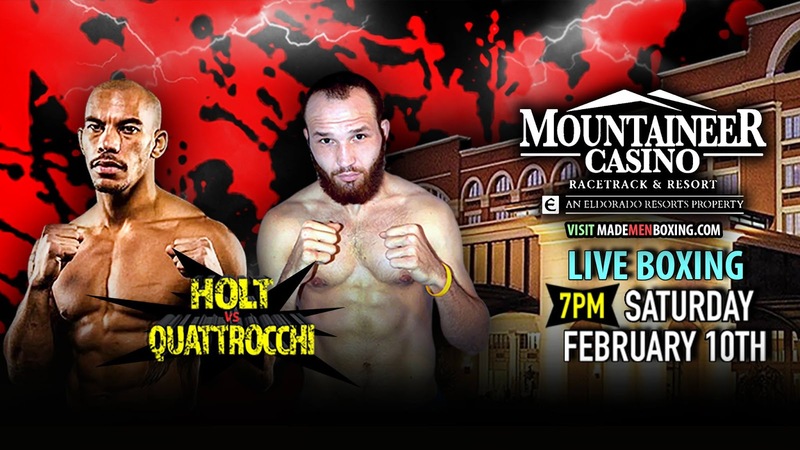 Headlining the card in next Saturday's main event will be a highly anticipated match for the West Virginia Super Middleweight Championship between Joey Holt of East Liverpool, OH and Aaron Quattrocchi of Follansbee, West Virginia. A series of videos have surfaced on the Made Men Promotions website showing no love lost between these two former sparring partners. 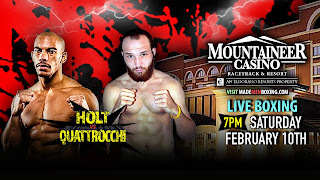 Quattrocchi, 28, who has fought some tough competition while compiling a record of 10-2-1 and winning the West Virginia State Middleweight Title twice makes has no qualms letting people know that Holt has faced nowhere near the competition he has. "I'm his toughest fight, he's not top three of mine. I'm definitely different than the guys he usually fights," said the naturally bigger Quattrocchi in a video promo. "I don't come to just collect a check and lay down". While Quattrocchi views Holt's resume as a collection of tomato cans, Holt views Quattrocchi as nothing more than light work. "He's a D-level fighter and stepping up in competition to fight me," said Holt in the promo. "You see what happens when he fights better competition he goes to sleep and it's gonna be the same thing when he fights me". Holt, 32, who holds a record of 9-0 with 7 knockouts plans to make this an early night for the hometown fans. "Coming against an opponent like Q when I got a guaranteed W and to be for a title is going to be huge for me," said Holt. "I'm coming for the knockout and it's going to be a nice night to get the W". While Holt plans on an early night, Quattrocchi has other plans for the future of Holt warning fans of the East Liverpool native they might want to make sure they attend this fight. "Both guys are home, there's not a road opponent here," said Quattrocchi. "I hope they buy a ticket because this might the last time this guy [Holt] steps into the ring". Doors will open at 5:00pm with the first bell being at 7:00pm. Tickets for this event which will also feature Niles, OH native Danny Rosenberger taking on Justin Steave of Weirton, West Virginia can be purchased at www.mademenboxing.com. Stay tuned for more on this card which I will be attending and covering in coming days.